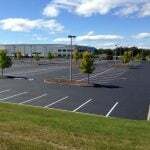 Commercial asphalt paving and repair services: EastCoat Paving Services. Q: Why should I choose asphalt pavement for my paving needs? Q: What is the purpose of crack filling? A: Asphalt is made from dried, crushed rock and asphalt cement. Asphalt is both extremely durable and flexible enough to accommodate imperfections. Damaged asphalt is also easy to replace as compared to other surfaces like concrete. Asphalt patching is both a cost-effective and practical means of repairing damaged asphalt. A: Hot rubberized asphalt crack filler is your pavements first line of defense against deterioration. Properly filling and sealing cracks on an annual or biennial basis is the most effective way to prevent small problems from turning into larger one. 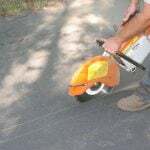 This is a great way to slow the natural deterioration of your asphalt pavement. 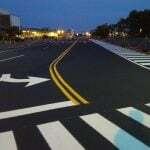 Q: How long should new asphalt pavement last? Q: How long should I stay off new pavement? A: Properly installed and maintained asphalt pavement can last up to 30 years or more. Proper maintenance would include things like patching, sealcoating, crack filling, etc. Depending on traffic, and atmospheric conditions on your pavement or parking lot, the lifespan may vary. Also, if your asphalt pavement is not being maintained, it will likely deteriorate quicker. A: Normally 24-hours is enough time to remain off your asphalt after paving. In areas where temperatures are particularly high, you may want to stay off the surface longer to allow it more time to cool. Q: Can I repair existing pavement? Q: How does sun affect my asphalt? A: Yes, asphalt can be repaired, however, depending on the condition of the asphalt, replacement may be a better option. 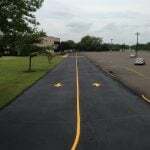 Asphalt patching is a very effective way for repairing things like potholes, raised or sunken areas, standing water, heavily cracked areas, catch basin problems, or snow plow damage. Crack filling is also a great maintenance and repair technique. If a minor crack is filled early, it can prevent bigger issues from occurring. A: Pavement’s rate of deterioration depends several factors starting with the quality of the install. Factors such as UV rays do effect the pavement’s deterioration rate overtime. The best way to combat this deterioration is regular professional maintenance and sealcoating. Q: What are the benefits of sealcoating? Q: What’s the best sealer for asphalt driveway? A: Sealer acts as a coating that helps to block out harmful UV rays, prevent moisture penetration, and prevent oxidation. Sealcoating is used as both a preventative measure in protecting your blacktop, but also an aesthetic upgrade. Sealcoating helps to extend the life and quality of your asphalt pavement. A: EastCoat Pavement services use the most advanced sealcoating process that adds years to the life of your asphalt. Using our top-of-the-line materials, sealcoating is used as a preventative measure against deterioration and is best when combined with our hot rubberized crack sealing program.